Creative leaders will be holding the key to attaining an economically developed and prosperous India by 2030, former President APJ Abdul Kalam said on Saturday. The IBIS hotel at Delhi's Aerocity has joined the league of three other hotels in the commercial complex that are trying to pass the security clearance of the Delhi Police in order to become fully operational. BJP Delhi Pradesh president Dr Harsh Vardhan today urged Lieutenant Governor Najeeb Jung to form a high-level monitoring committee under his supervision to monitor the admission process in schools. The meeting for the election of Mayor and Deputy Mayor of East and North Delhi Municipal Corporation has been scheduled for April 29 and 28 respectively. Shiromani Akali Dal Badal president Manjit Singh GK has written a complaint to the Chief Election Commissioner (CEC) on the alleged defamatory statement against him made by S Harvinder Singh Sarna, Member of State Minority Commission. At least 17 people were slashed with a blade by an unidentified man within four hours in north east Delhi's Jafrabad area on the intervening night of Friday and Saturday. The national Capital experienced a sunny Saturday with the maximum temperature two notches below the season's average at 36 degree Celsius. The Met office has forecast a partly cloudy Sunday. The Central Industrial Security Force has seized 40 kilograms of gold from passengers at Delhi's Indira Gandhi International Airport since the announcement of the Lok Sabha elections on March 5. An array of Indian textiles and a demonstration to show the process behind the making of handlooms are on display at an exhibition that began here on Saturday. Addressing students at the third Annual Commerce Convention of Delhi University (DU), Kalam said that a creative leader is the one who not only has a vision but also the passion to transform it into action. "A generation of creative leaders will play a huge role in attaining a healthy and happy India by 2030," Kalam said. Exhorting students to come up with out-of-box and innovative solutions to the problems, Kalam said ideas are no longer geographically or politically confined and soon there will be a time when borderless interaction will take place. An MNC in Bangalore has become truly multicultural with a Korean, an American, a Japanese and an Indian together solving a banking problem in Australia, Kalam said. By 2030, there will be a world of nations where the divide between the rural and urban, the rich and poor, developed and developing has narrowed down, he added. When asked by a student on the issue of corruption, Kalam said self-righteousness in the hearts of the youth of the country will ensure that India will overcome such an evil. "Government will not give you self-righteousness. It has to come from within you," he said. 'Leveraging Business: Discovering New Horizons' is the theme of this year's convention organised by DU's Department of Commerce. The police had earlier inspected the security arrangements at IBIS. They have given the hotel authorities a list of more than 32 points regarding the arrangements that need to be implemented. "During our first inspection, there were certain shortcomings in the hotel's security. We instructed the hotel authorities to remove these flaws. They have requested us for a second inspection which will take place next week. We will have to see if the issues have been resolved," said a police officer, privy to the details of the inspection. In the first inspection, the police had instructed the hotel authorities to ensure that there is restricted access to the hotel's rooftop, according to sources. The police in its list of security requirements to the hotels at Aerocity had made it clear that the entrances to the rooftops should have biometric systems. And only certain people such as a hotel's security officer can enter the rooftops. Other requirements include X-ray baggage scanners, under-vehicle scanners, licence plate reader and bulletproof windows for rooms that are facing the IGI Airport runway. 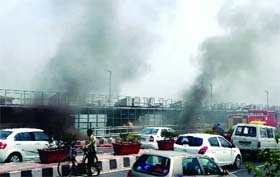 The Aerocity complex, which consists of about five hotels--eight others are undergoing construction--is a cause for concern for the police due to its proximity to the runway and a hangar of India's external intelligence agency, the Research and Analysis Wing. Securing Aerocity has been gaining importance in view of the expected increase in footfall at the complex, which will also have shopping malls. "About 50,000 people are expected to visit Aerocity every day," said the sources. Like IBIS, three other hotels at Aerocity named J W Marriott, Red Fox and Lemon Tree are yet to receive full security clearances from the police. "These three hotels have runway facing rooms, which have been sealed. These rooms will become operational if the Defence Research and Development Organisation (DRDO) approve the specifications of the bulletproof windows that will be placed in these rooms. Our concern is that no VIPs or planes are targeted from such rooms," said the officer. The fifth hotel, Holiday Inn, does not have runway facing rooms. This hotel in the Aerocity complex has received complete security clearances from the police and become fully operational. "This committee should monitor the admission process on day-to-day basis and submit its report to the LG. The report should also be made public through the media so that the Right to Education Act may be properly implemented in Delhi," said Vardhan in a letter written to the LG. He said after an amendment to the Constitution on August 4, 2009, education of children has been recognized as a fundamental right from April 1, 2010. Under this law, the children between 6 and 14 years of age must be provided free primary education by the state. "It is regrettable and a matter of grave concern that the Right to Education Act has not been implemented in the national Capital itself. Lakhs of children are being deprived of nursery and primary education due to arbitrariness of the primary schools," he said. He said that the admission process in the city has stopped. Parents, including those who have come from other states, are apprehensive that their children may not get admission. Vardhan requested the LG that he should personally look into this problem and ensure that all the children who want to get nursery and primary education get admission. According to provisions under Sub-Section (1) of Section 35 of the Delhi Municipal Corporation Act, 1957, the corporation will at its first meeting elect one of its members to be the Mayor and another member to be the Deputy Mayor of the corporation. The last date for filing the nominations for the posts of East Corporation Mayor and Deputy Mayor in the office of Municipal Secretary is April 21 and 17 for respective positions in North Corporation. Besides, the election to the three members of Standing Committee would be held. These vacancies are created after the retirement of Mehak Singh (BJP), Lata Gupta (BJP) and B.B. Tyagi (BJP) in East Corporation and Prithvi Singh Rathore (Congress), Rekha Gupta (BJP) and Yogendra Chandolia (BJP) in North Corporation. "Sarna has given a very wrong statement against me which has also been published in sections of media. I am holding a very important and responsible position representing the Sikh community. Action should be initiated against him," said Singh in his complaint. The Member of State Minority Commission had made allegations that since Singh did not get a BJP ticket for contesting Lok Sabha polls, the Sikh community of Delhi boycotted the meeting of Deputy Chief Minister of Punjab, Sukhbir Singh Badal. However, only six of the victims approached the police. They told the police that the attacker was accompanied by a woman, who was clad in a burqa. According to the police, the victims were slashed on their faces, necks, and hands. They underwent treatment at the Guru Teg Bahadur Hospital in Shahdara. The first attack was reported at about 9.30 pm from Ambedkar Basti. "We were informed that an unidentified man was attacking locals with blade," said a police officer, privy to the details of the case. But by the time the police reached the site of the incident, the attacker and the woman had fled. The first victim has been identified as a man named Sumit. He was returning home from work when the incident took place in Shiv Mandir Gali at Ambedkar Basti. "He was attacked from behind and sustained a cut wound on his cheek. The attacker immediately fled from the spot," another police officer said. Eyewitnesses told the police that they also saw a burqa-clad woman running with the accused. Soon two more men, Karan and Bhati, claimed that they had also been attacked in the same locality. They told the police that the attacker was running when he attacked them. The man then attacked a youth named Akash on his forehead in Gali Number 5 of Ambedkar Basti. A few hours later, more such incidents were reported from Maujpur Gali Number 3, 5, 7 and 11. Minimum temperature was recorded at 18.9 degree Celsius, two notches below the season's average. Sunday's maximum and minimum temperatures are likely to hover around 35 degree Celsius and 21 degree Celsius, respectively. "The skies will be partly cloudy. The day will become mainly clear from afternoon onwards," said an official. Sources in the CISF said that the force has seized gold in the form of jewellery, coins and bars from passengers entering the airport to catch a flight and those landing at the airport in different flights. The CISF has handed over the seizure to the Income Tax department for verifying if the articles were to be misused for the elections. Income Tax department sources said that it would take close to a month to identify or reach the sources of the gold. The CISF, which is responsible for the security of IGI Airport, usually does not search for the inflow of cash and gold, as they don't threaten the security of the airport. "But since the Model Code of Conduct for the elections began on March 5, we have been tasked to carry out checks on gold and cash smuggling at the airport. The gold and cash that we have seized until now mostly belong to businessmen. They were caught during random checking of passengers at the domestic airport and the terminal-3. The items have been given to the Income Tax department, who will check their sources and find out where they were to be taken," said the sources. The gold is internationally valued at about Rs 10.6 crore, claimed the sources. According to the laid-down procedures at the airport, only a passenger coming from abroad can carry one kilogram of gold if he or she has been staying there for at least six months. The only other way for a passenger to carry gold is by obtaining an export certificate for it.